I spent a week in June this year at Big Bend National Park with one morning dedicated to Santa Elena Canyon. It's a 45 minute drive from Terlingua, so you have to get up at least an hour before sunrise if you want that light. 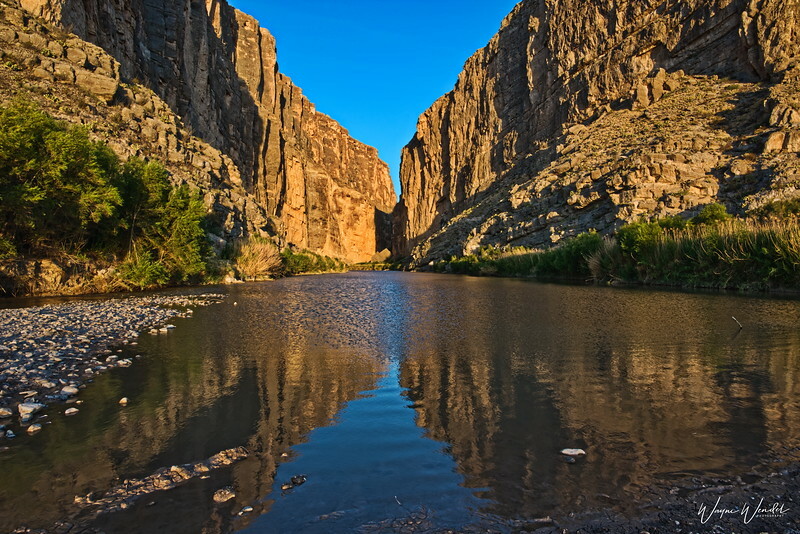 Santa Elena Canyon is the best known landscape feature of Big Bend NP. Those limestone cliff walls average 1500 feet above the Rio Grande River. That June morning I almost found the RG River still enough to get a nice reflection but the wind came up and rippled the water. I love how the soft sunlight bathes the walls of the canyon in almost a butter color. As you can tell I really love Big Bend NP and I'm looking forward to going back, yes in June, which is a "hot" month but not too many people venture there at that time. It's also a great astro-photography month. I hope you all had a great Thanksgiving and not too stuffed. I'm ready to get out and make some photographs. This is a marvelous shot! I love how this pulls our eye through the whole foreground and deep into the back of the canyon. Wonderful reflections too. Very well worth getting up early for. This is stunning! Great POV to feature the light on the high cliffs & reflections on the water. Wonderful light and reflections; well captured! Spectacular scenery. If paddling is allowed, I'll bet that affords even more intimate views of the canyon. Quite the testament to the power of water over rock. If 'water' were added to the 'rock, paper, scissors' game, water would be on top! Awesome landscape. Your view point certainly emphasizes the scale of the gorge. Beautiful reflections and detail. WOW, awesome POV and capture of the beauty of nature. Great reflections. I love reflections in any shot!